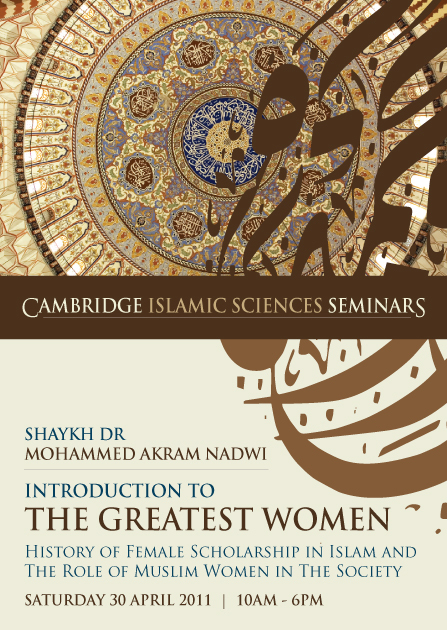 Cambridge Islamic Sciences: Why is "Women" The #1 Issue Islam is Questioned About? Why is "Women" The #1 Issue Islam is Questioned About? Is it totally unfounded or is there any truth to this? Have the observers not understood properly or is it the Muslims themselves who have got things mixed up, or both? If you have these questions then this is your unique opportunity to have a deeper and broader understanding of "Women in Islam" with a historic seminar with Dr Mohammed Akram Nadwi. The seminar is based on his ground-breaking research spanning over 7 years examining over 8000 female scholars of Islam and Muslim women in the society dating back to time of the Prophet Muhammad. We still have a few BUY-ONE-GET-ONE-FREE offers. So be quick to register! Please invite your non-Muslim friends. They will receive FREE GUEST TICKETS. If any Muslim finds it genuinely difficult to pay the full or special offer seminar fees they may apply for a scholarship. We have a very limited number of scholarships. Also please read the New York Times article "A Secret History" which talks about the research of Shaykh Dr Akram Nadwi which this seminar will be based on.